An international collaboration of scientists led by Omar Yaghi, a renowned chemist with the Lawrence Berkeley National Laboratory (Berkeley Lab), has developed a technique they dubbed “gas adsorption crystallography” that provides a new way to study the process by which metal–organic frameworks (MOFs) – 3D crystals with extraordinarily large internal surface areas – are able to store immense volumes of gases such a carbon dioxide, hydrogen and methane. This new look at MOFs led to a discovery that holds promise for the improved design of MOFs tailored specifically for carbon capture, or for the use of hydrogen and natural gas (methane) fuels. Yaghi, who invented MOFs in the early 1990s while at the Arizona State University, is now a faculty scientist with Berkeley Lab’s Materials Sciences Division and the University of California (UC) Berkeley Chemistry Department, where he also serves as co-director of the Kavli Energy NanoScience Institute (Kavli-ENSI). For this latest study, Yaghi and Osamu Terasaki, a chemist with Stockholm University, along with collaborators from institutes in the United States, China, South Korea and Saudi Arabia, interfaced a gas adsorption apparatus with a form of X-ray crystallography, called in-situ small angle X-ray scattering (SAXS). The result was a gas adsorption crystallography technique that uncovered evidence of cooperative interactions between gas molecules within a MOF. 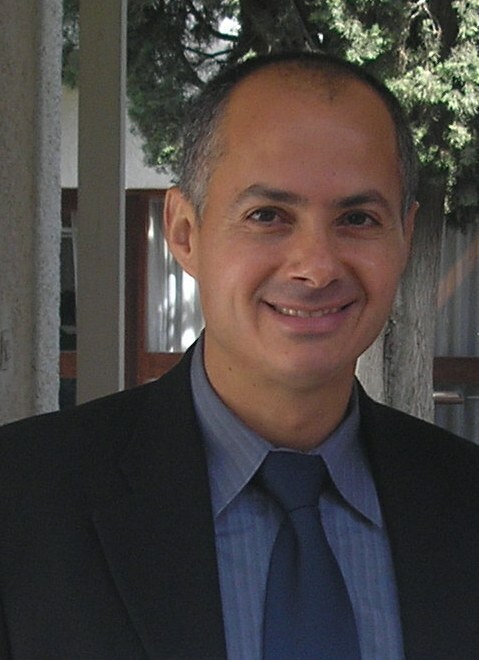 Omar Yaghi, discoverer of MOFs, is a chemist with Berkeley Lab and UC Berkeley and co-director of the Kavli Energy Nanoscience Institute. Yaghi and Terasaki are the corresponding authors of a paper describing this study that has been published in Nature. The paper is titled “Extra adsorption and adsorbate superlattice formation in metal-organic frameworks.” The lead authors are Hae Sung Cho, Hexiang Deng and Keiichi Miyasaka. Other co-authors are Zhiyue Dong, Minhyung Cho, Alexander Neimark and Jeung Ku Kang. Since Yaghi’s original invention, thousands of different types of MOFs have been created. A typical MOF consists of a metal oxide center surrounded by organic molecules that form a highly porous three-dimensional crystal framework. The variations on this basic structure are virtually limitless and can be customized so that a MOF’s pores adsorb specific gas molecules, making MOFs potentially ideal gas storage vessels. “One gram of MOF has a surface area of up to 10,000 square meters onto which it is possible to compact gas molecules into MOF pores like so many bees on a honeycomb without the high pressures and low temperatures usually required for compressed gas storage,” Yaghi says. The selectivity and uptake capacity of a MOF are determined by the nature of the gas molecule being adsorbed and its interactions with the MOF’s constituents. While the interactions of gas molecules with the internal surface of a MOF and among themselves within individual pores have been extensively studied, the gas-gas interactions across a MOF’s pore walls have not been explored until now. Shown here are the three gas regimes in MOFs: (A) gas adsorbates interact with pore walls (green arrows) (B) gas adsorbates interact with each other within a pore (blue arrows) (C) gas molecules interact with each other across pore walls (red arrows). 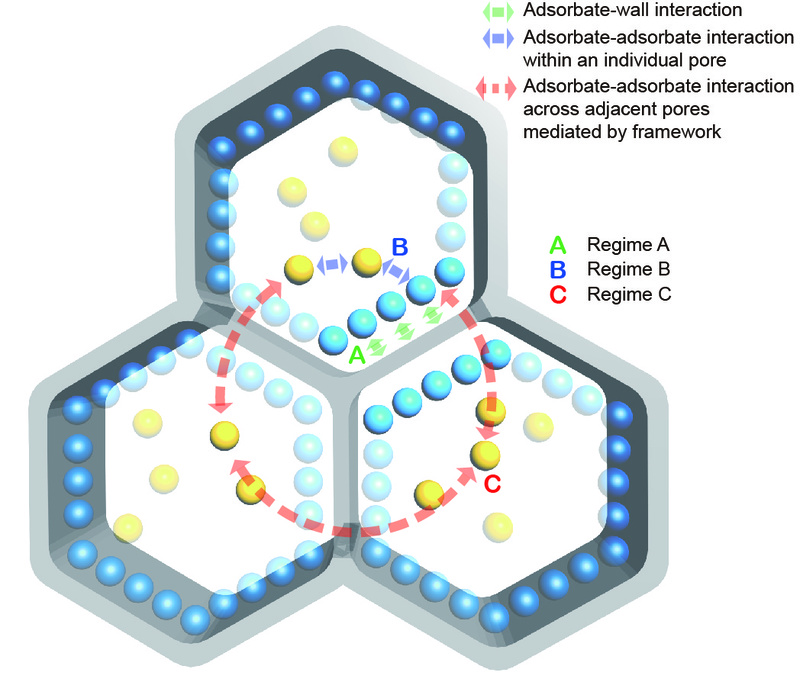 Light blue molecules are adsorbed onto the internal pore surface; yellow molecules are adsorbed in the center of the pores. With their SAXS-based gas adsorption crystallography technique, Yaghi, Terasaki and their collaborators discovered that local strain in the MOF induced by pore-filling can give rise to collective and long-range gas-gas interactions, resulting in the formation of superlattices that extend over several pores. The next step, Yaghi says, will be to apply this new gas adsorption crystallography technique to other porous molecular systems that can serve as gas storage vessels, such as covalent organic frameworks (COFs) and zeolitic imidazolate frameworks (ZIFs). DOE’s Office of Science is the single largest supporter of basic research in the physical sciences in the United States, and is working to address some of the most pressing challenges of our time. For more information, please visit the Office of Science website at science.energy.gov/.